As we come closer to the Academy Awards on March 2nd, we’ll be posting short profiles of each Best Picture nominee, attempting, in our own ways, to not only sum up what the movie is about, but why we believe it scored one of the nine coveted nominations, and why it could possibly take home the big prize come Oscar night. Enjoy! A good film aims to take the audience on a journey, sometimes literally. By the end of the film, something has changed, we’re a different person, or at least we’re at a different place from where we started. 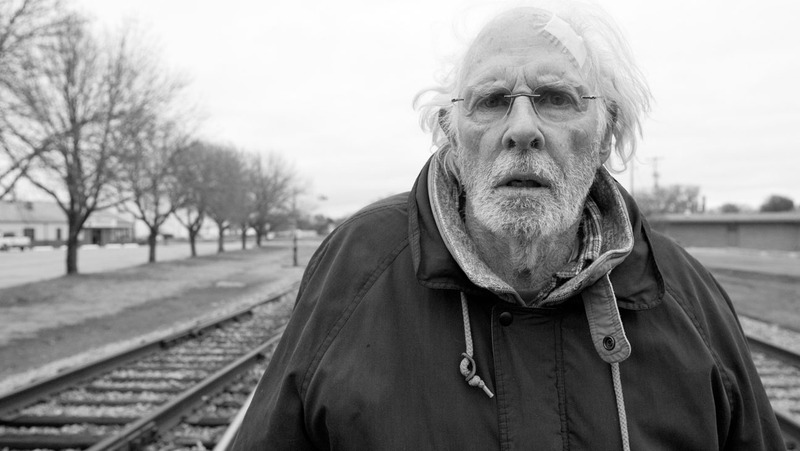 Woody Grant (Bruce Dern) knows exactly where he wants to go, but he might be the only one who knows why. The beauty of Nebraska is that the $1 million sweepstakes prize Woody is after isn’t what he wants; he just wants more. Filmed in beautiful black and white, Nebraska exists to record a time and place that may soon be long forgotten; the American small town. The towns are small, and the conversations are smaller. Everyone knows everyone, and there’s rarely such thing as a secret. This is where Woody grew up, in Hawthorne, Nebraska , and where he takes a pit stop on his way to Lincoln to claim his prize. His life before setting forth on this journey isn’t too glamorous. He lives at home with his wife, Kate (the hilarious, Oscar-nominated June Squibb), and is visited regularly by his two sons, David (Will Forte), and local news anchor Ross (Bob Odenkirk). Woody has retired, and is restless in his Montana home, and as soon as he finds the sweepstakes prize, he spends every day trying to find a way to get to Nebraska, until David decides he’ll take him there. Some people may choose to laugh at the people of Hawthorne. Others may actually find it quaint, wholesome. Reminiscent of a time and place that we don’t usually see portrayed in film. In fact, not much really happens in Nebraska, because nothing really happens in Hawthorne. But David’s commitment to take his father on this journey can be seen as a way of saving Woody. How much longer could Woody stay sane locked up in his home? Sometimes the only thing you can do is to just drop everything and go on what could be your last adventure with your dad. That’s what David realizes, especially by the end of the film. It’s a lovingly bittersweet ending, but again, not so eventful in comparison to some of the other nominated films. So why Best Picture? Because it’s hard to think of another film this year that had such a fascinating character study of such a forgotten pocket of contemporary America. Many of the other Best Picture nominees paint a beautiful picture of America’s past and America’s future, but Nebraska marvels in its’ portrayal of the America that exists in the here and now, the one we didn’t even know still existed. It’s one of the only Best Picture nominees where you can honestly just feel comfortable hanging out with these characters for two hours. This is helped by the genuinely charming and honest performances by Bruce Dern, Will Forte, and June Squibb, not to mention the residents of Hawthorne, played by mostly unknown actors (except an antagonist of sorts played by Stacy Keach). Nebraska is beautiful to look at, hilarious to watch, and quite charming to marvel at. Hilarious drama, dark comedy, whatever you’d like to call it, it’s definitely a worthy Best Picture nominee. For those who believe the journey is the reward, then set a course for Nebraska. This entry was posted in Best Picture Profile. Bookmark the permalink. Pingback: (Pop) Culturally Informed | Our Guide to the Oscars!